After the long school break, it's back to my usual routine again. Some how I am glad because I get to have more time to myself which means more baking!^_^. It's usually bread that comes to mind when I wonder which recipe to try out. What can I say, it's my favorite comfort food! After a visit to the salon yesterday, I went to buy some cold cuts, and decided on some lovely smoked chicken breast. Yup! 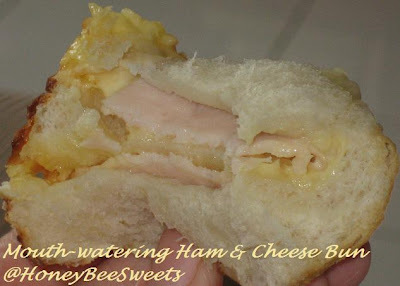 Been wanting to make some ham & cheese bread for my family, which happen to be my husband's favorite sandwich combo. After some "research", I came up with a bread dough recipe which should be pretty good. :) Hard work does pay off! The bread is great with the delicious smoked chicken and thin slices of Cheddar....why did I wait so long to make this?! In a small pot, cook the starter dough ingredients with low fire till the mixture comes together. Remove from fire and set aside to cool completely before use. Divide the dough into 2 equal portions. Half for ham and cheese, the other for other fillings of your desire. In one half of the dough portion, divide into 8 equal pieces. Roll round and let rest covered before shaping them. The remaining half dough portion, do what ever shape you like, else make more ham and cheese buns. For the 8 pieces, roll it into a round flat circle. 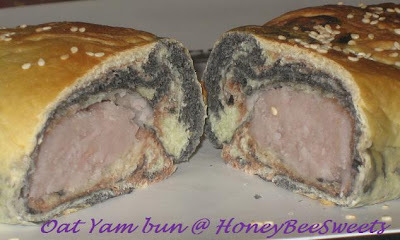 Place a slice of ham and cheese in the center and roll it up like a swiss roll. Seal the edges and cut right in the middle, so you have 2 small logs. Place the 2 small logs, cut side facing up in your desired greased baking pan. Repeat until all dough pieces, ham and cheese slices are used up. Bake in the oven for 40 minutes till the top is golden brown. Remove from mould after 5 minutes and let cool on rack. Yikes! This Koala bear is spitting foam! Technically it's cream cheese...but geeze...it just pop out right at the mouth area?! Have to admit it looks gross! If you know what "吐白沫" means...this is the exact looks for that, hahaha! Hope you did not lost your appetite upon seeing this. :-P Guess I better "clean" up the "foam" before giving it to my girls...else they might find it not so appetizing after all, haha! You must be going "Eee...so small and simple cake!". Hmmm...I should have placed something beside the cake while taking this picture to show the relative height. This is no small cake, it's actually 5.5 inches tall and 9 inches wide (almost can't fit into my fridge!!). Simple? Mmm...I will let you be the judge of that as we move on. 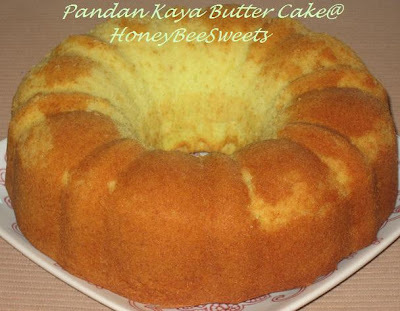 In a large mixing bowl, cream the butter and 200g sugar together till it is light and fluffy. Then add in the egg yolks and mix well. In separate mixing bowl, beat egg whites and the remaining 100g of the sugar till stiff peaks. Preheat the oven to 180°C. Greased and lined with parchment paper a baking tray of 10"by12". Pour 1/3 of the cake batter into the prepared baking tray and bake in the oven for 15 minutes. Then lower the temperature to 170°C to bake for another 5 minutes. Bake till cake is done and remove from oven to cool completely on rack. Repeat the above step twice again till all the cake batter is baked and you have 3 sheets of chocolate cake of 10"by12" in size. After the cakes has cooled. Cut the cake length wise to get two 5" by 12" cake sheets. Repeat with the other 2 cake and you will arrive with 6 sheets of 5" by 12" cakes. Spread 1/6 of the chocolate cream all over the surface on one of the cake sheet. 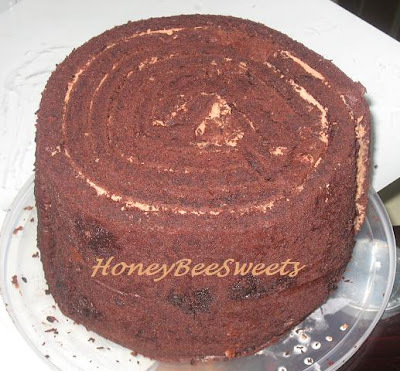 Then roll it up from the short side inwards in a swiss roll form. *Phew* That was tedious! 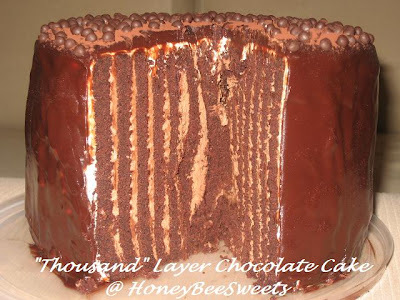 I have to admit this is no easy piece of cake to make! But the end result makes it all worthwhile. :) This ingenious idea is originated from one of the latest cookbook I bought lately, "Chocolate Dreams" from some Taiwan publisher which I bought from Kinokuniya. But I did not follow the recipe from the book but came up with this chocolate cake recipe myself, only following the shaping method it showed in the book. Be sure to use the best quality dark chocolate you can find. I used Valrohna so there was no doubt on how well the chocolate taste turned out. The cake was chocolaty of course, plus it's moist and soft. 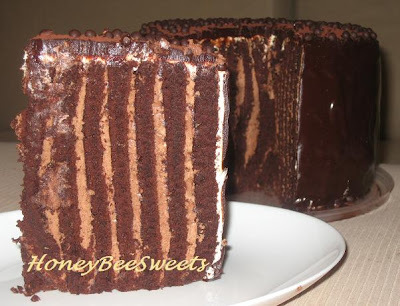 It's not too sweet and the chocolate cream makes it smooth and silky. 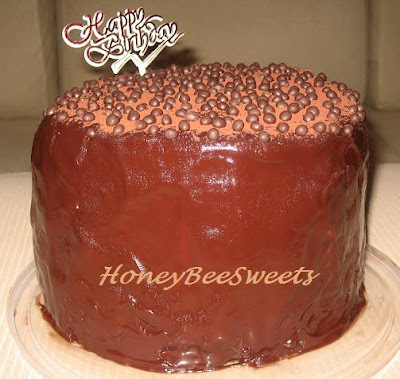 The deep chocolate coating plus the mini chocolate balls makes it such a treat to eat the cake...definitely a chocolate lover's dream come true! Not to mention, my whole family enjoyed the cake a lot. 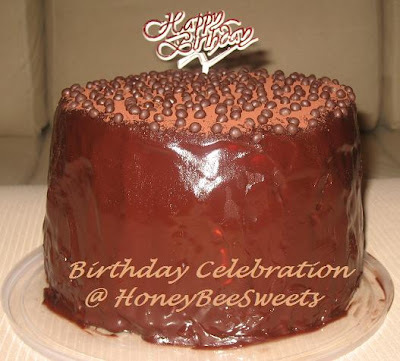 Hope I have redeemed myself for not able to make a cake for my hubby on his actual birthday. :-P Anyway, Happy Birthday Dear! Have been away back home in Singapore for the few days. It was a super long school break due to Hari Raya for the kids here in Malaysia, a total of 10 days! Now I just worry that they might get grouchy when school starts next Monday....ain't looking forward to that. :-P Like any other school holidays, I am always looking for ways to have fun with my girls in baking when they are home with me. 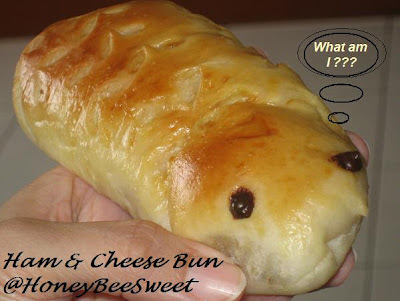 Besides, I was itching to bake since the long break.This time, I decided to bake another fun bread recipe which I sooooo want to make for the longest time. 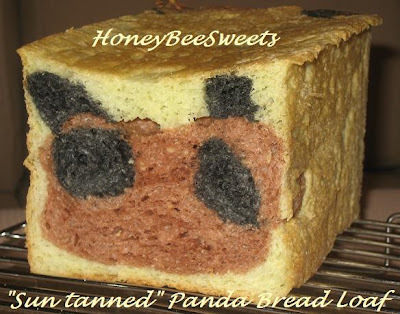 :) Yup, the Panda bread...err....for my case, specifically the "Sun tanned" Panda bear bread, haha! Why suntan? 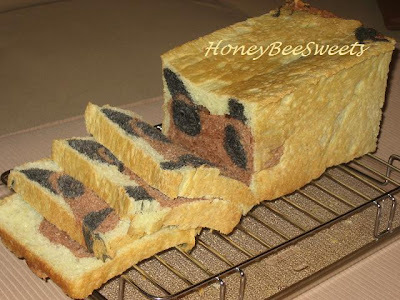 Well, I thought chocolate flavored bread will probably taste much better then plain ones...anything is better with chocolate, at least in my philosophy! So brown==sun tanned? Hahahaha! 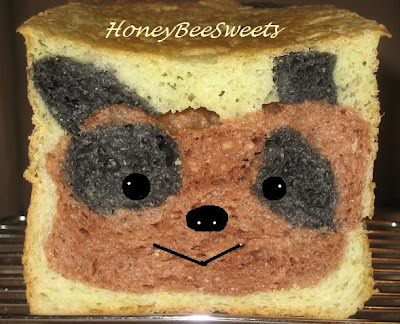 I can't stop smiling when I sliced open the bread loaf and seeing that cute bear face inside. :D I was so worried that it won't turn out right...like the ears sticking together or one eye drooping down etc. Luckily it was still acceptably recognizable, heehee! 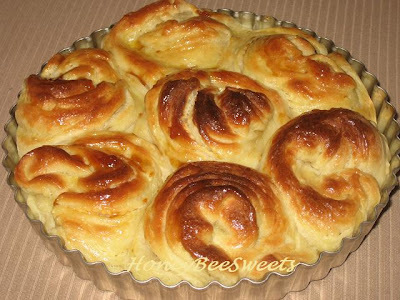 This recipe was inspired by Florence (Do What I like) which she also extract it from Cookpad. However I modified it to make it into an oat bread version. I shall post this recipe here for my own future reference. Cook the oats and milk in a pot at medium low heat till it becomes a thick paste consistency. Let cool on a plate for later use. In a large mixing bowl, add all the other ingredients for the bread except for butter and mix well. Add in the above oat mixture and knead to form a soft dough. Continue to knead for 20 minutes till it's not sticky and elastic. Add in the butter and continue to knead the dough till it's smooth. Divide the dough: 200g for charcoal powder mixture, 400g for cocoa powder and the remaining for the pandan mixture. Knead the flavoring into the dough respectively and let proof in separate greased containers, covered for 90 mins. Punch out the air, and let proof again for 30 minutes before shaping. For shaping details, please refer to the original recipe here. Good luck! After shaping, place the whole dough into the bread tin (10cmX10cmX25cm) covered, to continue proofing for another hour. Preheat oven to 180°C. Bake in the oven (covered) for 42 to 45mins till done. Let loaf cool in tin for 10 minutes before unmoulding. Then remove from tin and let cool on rack completely before slicing. Ta-dah! The bread is soft and fragrant, again no evident oat taste at all. Neither of the flavorings overpower the other, just a slight scent each, so it was great overall. 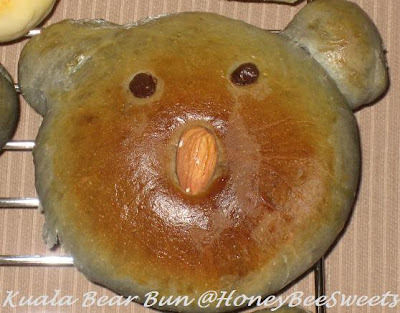 My girls were absolutely amused when I showed them the bear face in the bread. Better yet, they like eating it, which little did they know the wholesome oats I added in which makes this a fun, tasty and healthful loaf. Tripe score!!! And since the amount of dough I used was more then enough to fill the bread tin, I kind of portion out like 1/6 of the left over dough to make a large oval yam bun. Okay, why that title? It's either I made a tiramisu cake or I don't. It a long story, so bare with me a little. :) Last Saturday me and my girlfriends went out for a pre-celebration for 2 of my friends' coming birthday. It was a nice dinner at Alexis Bristol at Bangsar follow by a couple of drinks at Finnegan's Irish Pub. It was a wonderful night, something I will remember for a long time. :) While dinning at Alexis, my friends were all raving about their wonderful tiramisu and it's a MUST try desert. So I was really looking forward to trying it. 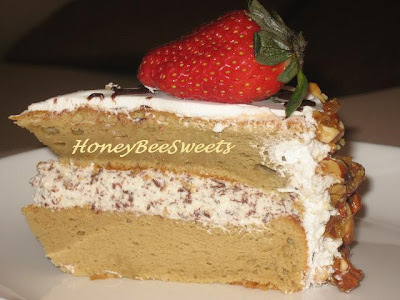 Indeed it was a tasty cake, deep coffee flavors, soft chiffon cake soaked in coffee liquor and crunchy caramelized almonds on the sides, not your usual tiramisu I would say. :) After "carefully" tasting the cake, I decided (in my mind) that I should try making something similar just for my friend's actual birth date, since she really enjoyed the cake in Alexis. In a large mixing bowl, add the egg yolks and 30g of the caster sugar. Beat mixture till light in color. Melt the coffee powder in to the milk and stir into the egg mixture till well combined. Add maple syrup and cooled melted butter into the egg mixture and stir well. Sift cake flour and corn flour into the egg mixture and stir till everything comes together. In another mixing bowl, beat the egg whites with the remaining caster sugar and cream of tartar. Beat till stiff peaks. Preheat the oven to 170°C. 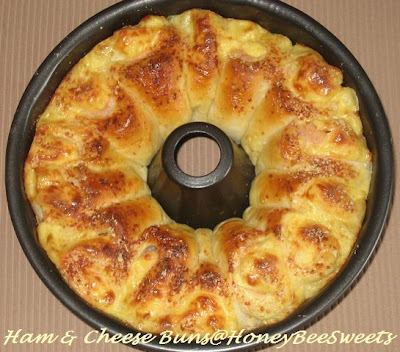 Grease and line with parchment paper an 9 inch round cake pan. Gently fold in the egg white mixture in 3 separate portions into the flour mixture till everything is combined. 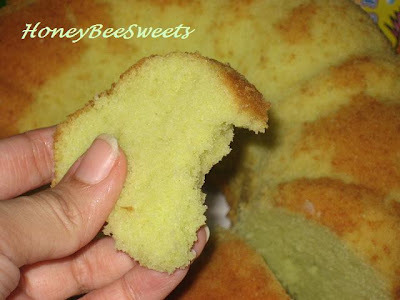 Pour the cake batter into the cake pan and bake in the oven for 35 to 40 mins. Let cool in the pan for 5 minutes before removing it and cool completely on the rack. Cut the cake into 2 discs and set aside. Meanwhile, make the filling. Beat the cream cheese & sour cream with sugar till creamy. Add the chocolate shavings and mix well. Finally add the whipped cream and stir till everything is well combined. To make the caramelized almonds, place the sugar and water in a small pot and start to boil the mixture. 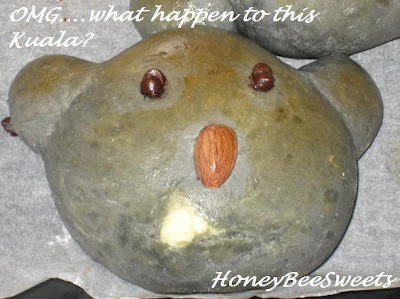 Once it almost changes to yellowish color, add the almonds and stir well. Remove from heat and pour on to a parchment lined tray. Spread the mixture evenly and not in clumps. Let cool completely. Then break up the pieces and set aside. Spread the filling evenly on top of one of the cake disc. Place the other cake disc over it. 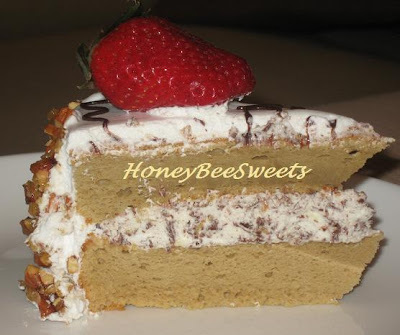 Spread the whipped cream all over the cake evenly. Plant the caramelized almonds all around the sides of the cake. Decorate at will. I apologize for the quality of the pictures (so dark!). Was kind of in a rush to finish it so that I can give the cake to my friend, so did not take the time to take the pictures nicely. :-P But luckily the taste of the cake turned out good. I just wish I had more time to decorate it nicely. I merely just pop 2 fresh strawberries on top and piped the wordings over. :-P Wonder how long I take to make this cake? 4hrs++. :) But I guess time does not really matter since I do enjoy baking so much, haha! As you can see the coffee and the maple syrup kind of turned the cake into a nice brownish tone. ;) The maple syrup essentuates the taste of the coffee, nice! The sponge cake did not really rise as nicely as I hoped for, some how I always have problem with this. :-P But overall it was really acceptably soft and with the crunchy almonds, it was pretty good. Everyone enjoyed the cake, including the little ones...I was a little worried at first that the coffee flavor might turn them off! :P The filling in the middle was a pleasant surprise, tasted like cookies and cream cheese ice cream, haha! 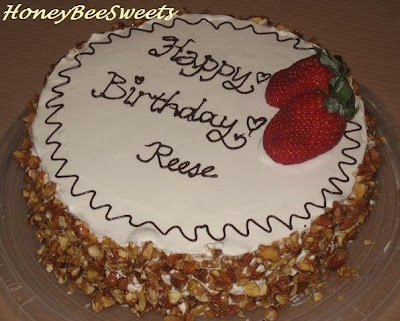 Although I have only known Reese for less then a year, we share a common strong interest, which is baking and cooking. She has this jovial and non-pretentious personality which can brighten you up. She's also generous to the people around her, especially on the food, haha! I was glad to bake this cake for her, and even more so when seeing the joy in her when she saw it. 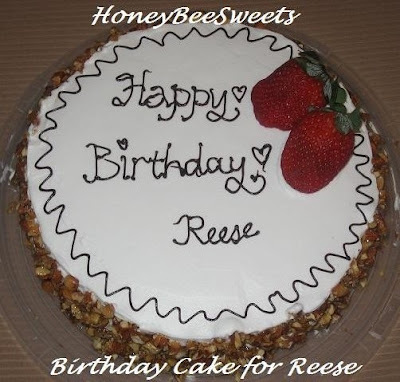 Happy Birthday Reese! Do you find yourself running out of time? I do. There's so much on your plate, things that have K.I.V. for awhile now, but you just did not bring yourself to do it? That's me sometimes. It's frustrating, with the ongoing daily routine, it's really easy to get those things slipped out of your mind. *sigh* Take this post for example, it was meant to be posted out last Sunday, but I only got time to seat down to write out till today. :-P Nevertheless, I always tell myself it's better to keep oneself busy rather then wondering what to do next. 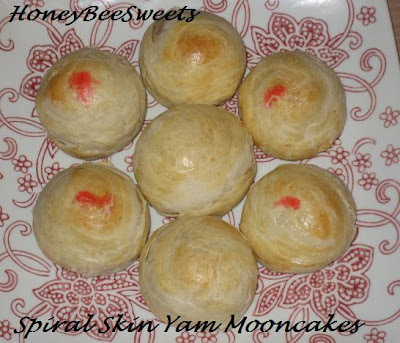 Expected, this will be a busy week for me as I need to make mooncakes, not just for the family but friends as well. I already have all the ingredients but putting them on hold till the last few days because I want them to be fresh. :) Anyway, that will be in another post. Today the usual stuff, bread. 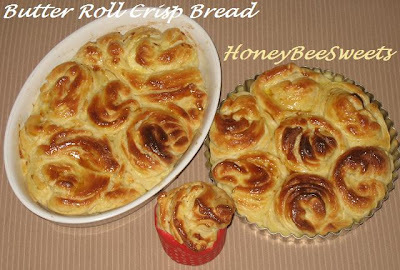 It's Butter Roll Crisp Bread to be specific. Again something that I saw awhile back but waited till now to try it out. Knead the ingredients bread dough together till it's smooth and elastic. Let proof in a covered container up to 90 minutes or more till double in size. Punch out the air and roll into a ball. Let rest for 20 minutes before shaping. Roll out the dough on a lightly floured surface into 20cm by 40cm rectangular sheet. 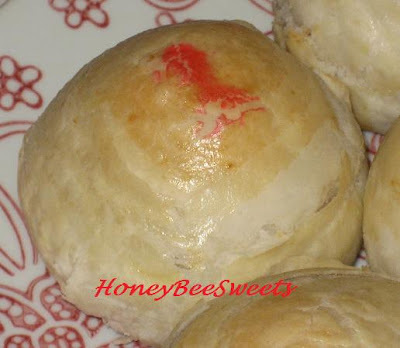 Spread one portion of the salted butter on to the dough evenly, leaving 1" at the edges. 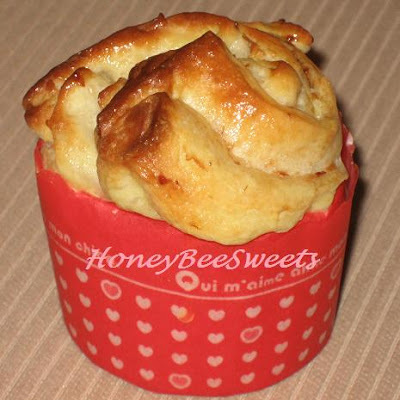 Fold up the dough in a letter form and again roll out into 20cm by 40cm rectangular sheet. At this point if the dough is hard to manage, chill in fridge for 15 minutes before working with it again. Spread the 2nd portion of the rectangular sheet dough and fold in letter form again. Again repeat the above, then spreading the cream cheese at last. Finally fold and roll out into 10cm by 20cm. Using a rubber scraper, cut the dough into half, meaning 2 pieces of 10cm by 10cm. While working on one, chill the other portion. Cut the dough into 10 strips of 1cm by 1cm. Do not worry if you don't get the measurement accurately, just make sure you can get at least 8 to 9 strips of dough out of one portion. 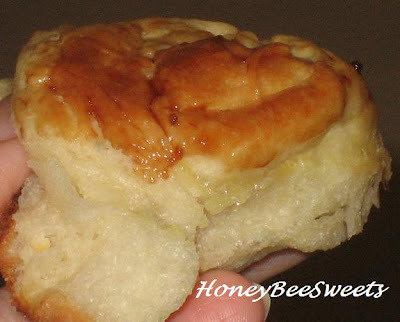 Twirl the strips, cut side facing up and coil the dough up and place in a greased baking pan of your choice. Repeat till all dough is used. Let proof for 45 minutes. Preheat the oven to 200°C. Brush the top with egg wash and bake in the oven for 20 to 24 minutes till top is golden brown. Once out of the oven, you can glazed the top with warm jam else leave it to cool on rack. Since I did not put a lot of cream cheese, there was no evident taste of it present. But the butter taste of the bread was real nice. And since I also glazed the surface with some warm apricot jam, it kind of loses it crisp top too. :-P But the shine from the glaze looks good, haha! 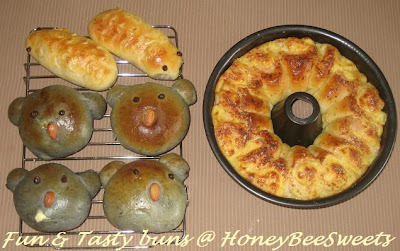 I experimented baking the dough in different baking moulds. It turned out the muffin cups looks really good! Like a "flower" bun blooming away, haha! Last Sunday evening, I was really in the mood for some pizza. But decided to twist the recipe and change it into a calzone! I used the usual wheat pizza dough and pasta sauce I have, and get it all "wrapped" up into 2 giant calzones. Actually, it looks more like 2 giant curry puffs to me, haha! Due to my poor sealing method, the cheese was oozing out from the sides while baking in the oven! But my husband was really happy when he saw that and commented he loves "crispy" cheese, haha! 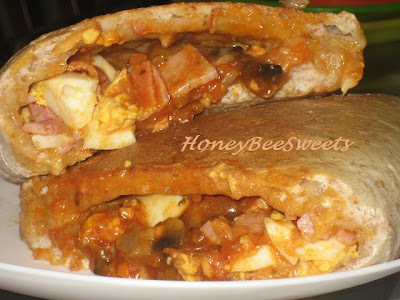 In my version of the calzone, I added hard boiled eggs, honey baked ham and the usual pasta sauce. It was an instant hit! My family loves it! The 2 whole calzones were gone in a flash soon after it came out from the oven. ;) I used to make calzones all the time while I was in California. But kind of forgotten about it until when we went dinning at a place call Murni's in SS2. At Murni's, they serve up this "Dragon Pizza" which is actually a calzone that looks like a dragon's back. 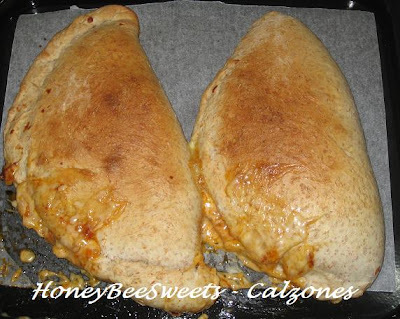 Anyway, I will definitely make calzones again in the future but perhaps with different filling and shaping method. ;) Cheers! What have I been up to lately? Sudoku. Have you played Sudoku before? If not, you should really try it! It really gets your brain juice working! Perhaps I have already miss the "trend"? Because it was an international hit in 2005. And for a period of time, Sudoku was quite a hot topic, but now, it kinds of quiet down a little. Nevertheless, it's still pretty popular since they still offer a wide range of books in store. Yeah, you guessed it, I'm addicted to it now. When I get some free time, I'll start doing a puzzle. No, I'm not an expert at it, but somehow I like being able to complete the number puzzles...sort of a tiny accomplishment for me, haha! Furthermore, I need to get my rusty brain working these days...else all I think about is the usual daily routine. :-P Lately me and my better half would just quietly seat by the sofa and furiously working on a Sudoku puzzle, haha! And because of that...I'm really behind on my posts!! This is one of those "So much to do, so little time" thingy. Anyway, if you're interested to try out this game, click here! You must be wondering about my post name....Linzer Cookies? I know it's no where near Christmas yet. It's not even Mooncake festival! 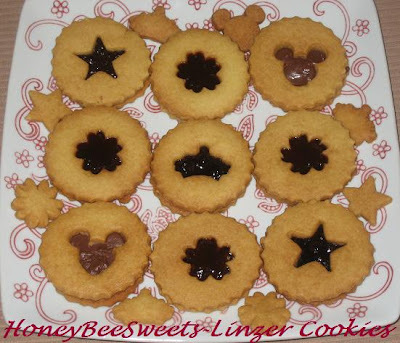 I just happen to have the mood to make some Linzer cookies . 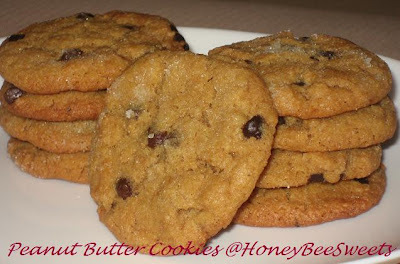 :) Love the buttery, melt in your mouth texture. ;) So who says we need to wait till Christmas for these delicious treats? In a bowl, sift together flour and salt. Set aside. In another large bowl, cream the butter and sugar until smooth. Add vanilla extract and stir till well blend. Add the sifted dry ingredients and mix well till it comes together. Press the dough together to form a ball, divide into half. Flatten each dough into a disk and wrap in cling warp. Refridgerate until firm, about 40 minutes. Remove one of the disk from the fridge. Lightly dust the work surface with flour and roll out the dough to about 1/4" thick. 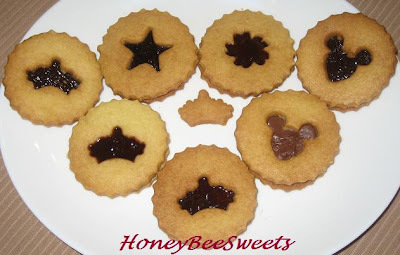 Use desired cookie cutters and place the cookies on parchement lined baking tray. make sure you have same number of cookie base and top. Top meaning there will be a small cut out in the center. 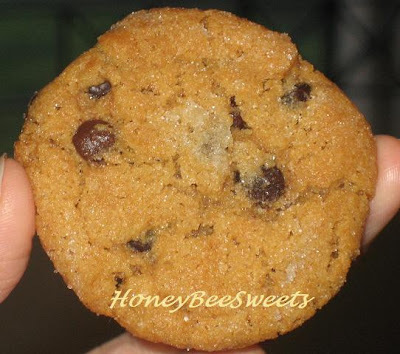 Bake the cookies for 14 to 16 minutes, till it turns light golden brown. Transfer on rack to cool completely before filling them. 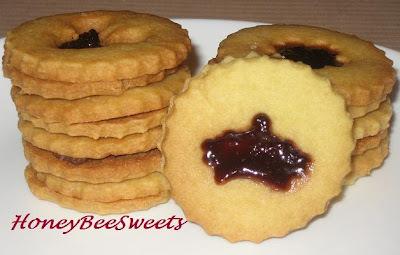 Leaving a 1/4" boder uncoveres, spread about 1 teaspoon of the jam or chocolate filling to the cookie base. Sandwish the cookie base and top together. Dust a little confectioner's sugar on the surface if desired. Store in aritight containers up to 4 days. Put ingredients A into a mixing bowl and stir until well mixed. Form into small balls. 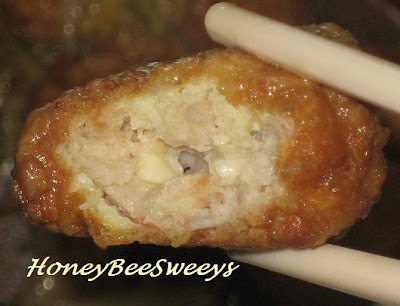 Coat the balls with corn flour, then deep fry them in cooking oil until golden brown. Dish and drain. In a claypot, heat up 1 tbsp cooking oil. Saute the garlic and giner until fragrant. Add mushrooms, Chinese cabbage and seasoning. Cook till the vegetables have release it's liquid and soften a little, add the meat balls. Continue to simmer at lower fire for abohter 10 minutes till the sauce thickens. Serve hot with steam rice. 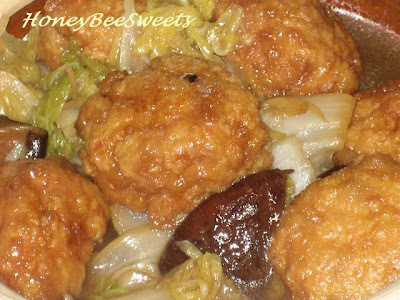 This is a delicious dish to go with steam rice. 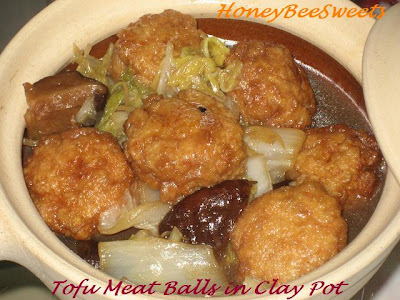 ;) The tofu meat balls is tender due to the added tofu and flavorful too, something the old and young will enjoy. I love dishes that has gravy with them. I enjoy drizzling the tasty gravy over steam rice...which now has also been a habit for my girls. ;) No clay pot? No worries, use any pot you have, it will taste as great. 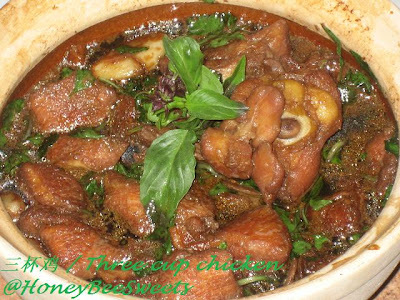 ;) Do try out this simple and delicious dish tonight.